On July 15, 2014, Google turned off Basic Authentication for all users and now requires all mail clients to use oAuth 2.0. Outlook and other desktop email clients do not currently support entering the pin codes required by oAuth 2.0 and must use special app passwords instead. With Basic Authentication turned off, users who are not not using two-step verification will be unable to connect to Gmail servers using Outlook, Thunderbird, and other email clients. An email is generated when an email clients attempts to log on and is blocked. If you are using two-step verification, you do not need to enable basic authentication; accounts with two-step enabled require an application-specific password for access using applications, such as Outlook, that do not ask for the pin code. You have two choices: enable two step verification and use app passwords in clients that don’t support pin codes or turn basic auth back on. Two step verification is more secure and is highly recommended. 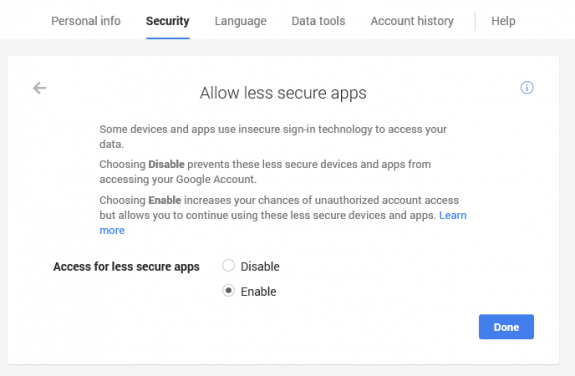 To turn Basic Authentication back on, go to Gmail account settings and choose Allow less secure apps. If you aren't using two-step verification, you can enable it in Settings. You'll need to create an app password to use instead of your normal Gmail password. I've tried both. It's currently set to basic. Have you tested it with a new profile? Keep the current profile but try making a new one in Control panel, Mail and see if it errors. I would also enable two factor auth and create a new app password. I'm having the same issue and have been trying to resolve this for weeks. I have done your above steps many times and can't get Outlook to work. It was fine for years and just started receiving this error last month. Any other ideas? I have my incoming port to 993 and Outgoing to 465. Are you using Basic authentication or two factor? Just wanted to say that your post helped me to immediately get to the bottom of the strange symptoms that had been appearing in my Outlook these last few days. Like you say a simple case of enabling two-step auth with my phone and then clicking through to generate an "App Password" for "Windows PC". After changing the password in my Outlook Account Settings to the new App Password generated, Outlook sailed right through and downloaded all the queued mail. Are you using an antivirus addin in Outlook? Do you have two factor authentication enabled on the account? I have the same problem as satish, No AV addin in Outlook, and Yes for 2 setup authentication. I've been using it for over 2 years, as well as the App Password for Outlook 2013. It stopped working in October and I've reconfigured Outlook multiple times and recreated the App password multiple times as well. What port settings are you using? Thank you!! Finally a solution. Diane, this was very helpful. Its all done with your help with video. thank you.